Dream. Dress. Play. 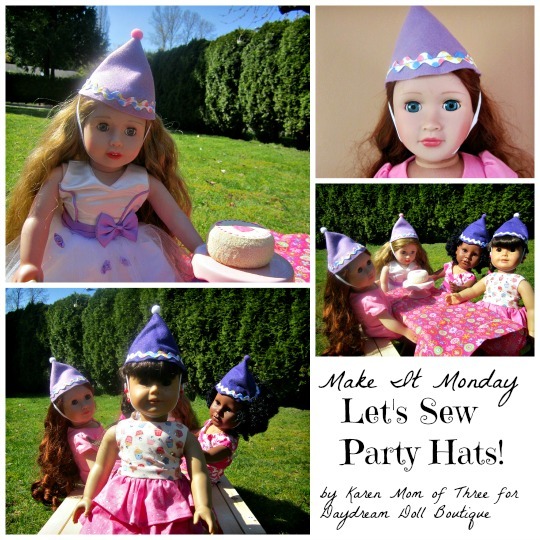 : Make It Monday- American Girl 18" Doll Sew Party Hats ! 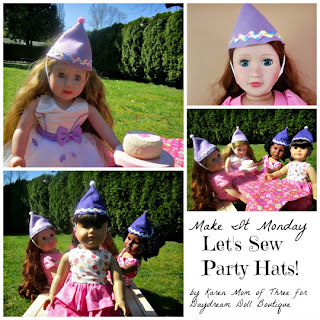 Make It Monday- American Girl 18" Doll Sew Party Hats ! Did you know that Spring is a busy time for American Girl Historical Birthdays? April Birthdays include Rebecca on April 4th, Addy April 9th, Felicity April 21st and Molly April 22nd. May birthdays include Julie May 1st , Kit May 19th , Samantha May 26th and Cecile May 28th. I thought it would be fun to share with you a simple party hat you can sew from items you can find in your craft supplies or at your local craft store. I love using what I have on hand and I think you will agree that a well stocked craft area leads to hours of doll play crafting fun. Step 1- Select your side plate from the kitchen, you can use a dinner plate but your hat will be a little bit bigger. Turn it upside down on your paper and trace it. Step 2- Cut out your circle and fold it in half. This will be your pattern piece for the party hat. Step 3- Fold a piece of felt in half and place the pattern piece on it. Cut around the shape. You will now have two pieces of felt to create your two party hats. Step 4- Thread your machine and get ready to sew the rickrack on to the round part of your felt as shown in the photos above. Trim away access thread and rickrack when you are done. 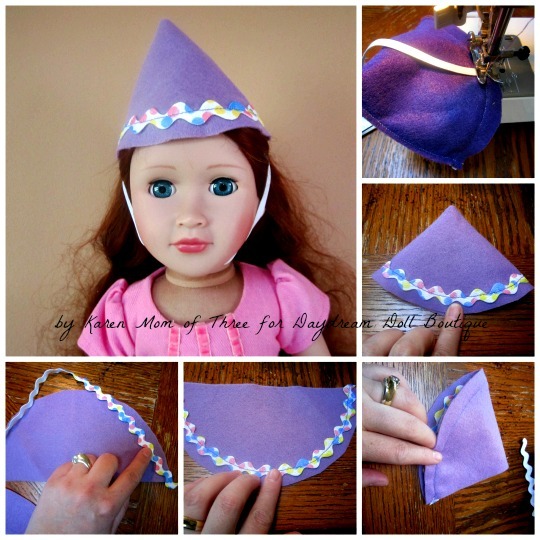 Step 4- Fold your hat in half as shown in the photo above and sew down the seam from top of the triangle to the rickrack edge. Step 5- Fold your hat inside out to see your hat, the seam you just created is now the back of your party hat. Step 6- Fold your hat inside out again and prepare to attach the elastic to the hat. Step 7- Cut 6 inches of elastic and fold your hat so that the back seem is not where you are sewing. Step 9- Attach the elastic to the hat as shown in the top right corner above. Sew through the elastic. Make sure to backstitch to hold the elastic in place. Repeat on the other side. 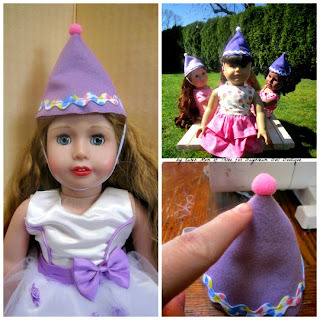 Step 10- Heat your glue gun up and add a dollop of glue to the top of your hat and press a small pompom into place. Let it dry. Then Place on your dolls head. 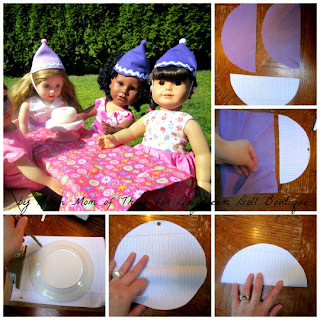 Step 11- Create your second hat and while you are at it create some for all your dolls! These make great party favors and gifts! Come and Visit us at Simple Treasures this week ! Come and Visit us At Battlecreek this Week ! Don't forget to enter our Spring Giveaway !